To economists: In today's “throwaway” society, what isn’t needed is thrown away, because the human person isn't at the center. When something else is at the center, people are at the service of that. Study new ways to save the human person, so we return to the center of society, of thoughts, of reflection. To migration colloquium: Tens of thousands of children migrate unaccompanied to the US from Central America and Mexico to escape poverty, usually in vain. Protect and help them because they're vulnerable and defenseless, inform them of the dangers, and promote development in their countries of origin. We need to change our attitude away from defensiveness, fear, indifference, and marginalization–typical of a throwaway culture–to one based on a culture of encounter, the only culture that can build a better, more just and fraternal world. 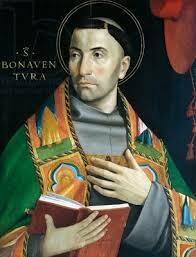 Universalis: St. Bonaventure, teacher, philosopher, friend and colleague of St. Thomas Aquinas, defender/head of Franciscan order. See Catholic Encyclopedia, Wikipedia. Creighton: Jesus worked miracles in the cities he reproached, but they declined the opportunity to repent. Let's be like the other cities, show faith and trust, repent, persevere, and be saved. Passionist: Jesus and St. Bonaventure were agents of change: Jesus preached the nearness of God's Kingdom, though many didn't take him seriously. St. Bonaventure led the Franciscans through changing times, adapting St. Francis's message for growing towns, though their message was often ignored too. Do I take Jesus' message seriously and live it? DailyScripture.net: Jesus was likely upset with these communities because of their indifference. Repentance demands change, of heart and life.